Following remand, the court denied plaintiff's motion to reinstate its award of attorney fees under 35 U.S.C. § 285 because of plaintiff's own misconduct in seeking a TRO. "The Federal Circuit concluded not only that '⁠[plaintiff's] misconduct cannot be disregarded on the theory that failure to award fees is equivalent to double-sanctioning [plaintiff],' but also 'that [because] this misconduct has already been sanctioned[, it] should be weighed more heavily, rather than be excluded in the 35 U.S.C. § 285 analysis.' Defendants urge that '⁠[l]itigants who sanctionably lie do not deserve a fee award.' The Court sanctioned [plaintiff] for submitting [a] deceitful declaration in support of the TRO, 'without a colorable basis' and 'in bad faith, i.e., motivated by improper purposes such as harassment and delay.' 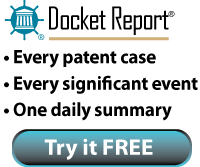 Weighing this litigation misconduct more heavily, considering the Court's findings that [defendant's] noninfringement argument was not groundless and that its litigation strategy was reasonable, the Court finds that [defendant's] conduct did not warrant fee shifting as an exceptional case under either the Patent or Lanham Acts."